God Brought Me Here For A Reason: Judgment Day- Be Prepared! What did you do last Saturday before 6:00 PM? 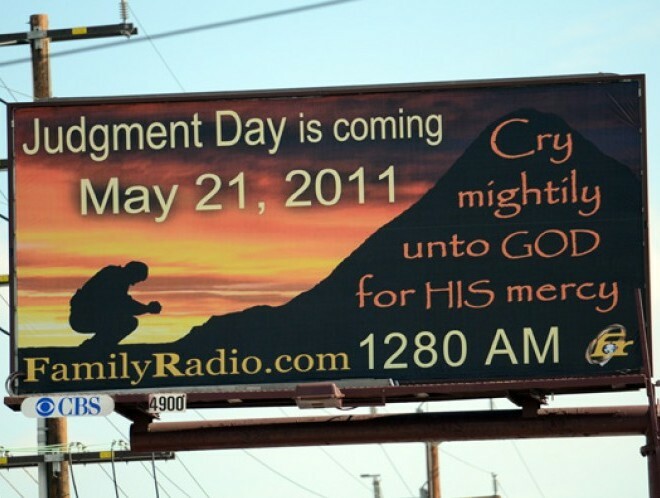 Are you one of those who were frightened of the May 21st End of the World phenomenon? If you spent that day making peace with all those whom you have encountered, then good. If you are one of those who were truly repented, better. If you are one of those who cried hard before God, best. However, when you realized that it did not happen, how do you reacted? Mad? Sad? Disappointed? Relaxed? Thankful? Well, I really do not know how other people reacted about it. One thing is for sure: In our church, we are all firmed in our stand: NO ONE KNOWS WHEN THE WORLD WILL END EXCEPT GOD THE FATHER. "Wars and revolutions will be among the signs that Christ's return is near. Jesus predicted that chaos would increasingly reign as the time of his return approached. " 36"But the exact day and hour? No one knows that, not even heaven's angels, not even the Son. Only the Father knows. 37-39"The Arrival of the Son of Man will take place in times like Noah's. Before the great flood everyone was carrying on as usual, having a good time right up to the day Noah boarded the ark. They knew nothing—until the flood hit and swept everything away. 39-44"The Son of Man's Arrival will be like that: Two men will be working in the field—one will be taken, one left behind; two women will be grinding at the mill—one will be taken, one left behind. So stay awake, alert. You have no idea what day your Master will show up. But you do know this: You know that if the homeowner had known what time of night the burglar would arrive, he would have been there with his dogs to prevent the break-in. Be vigilant just like that. You have no idea when the Son of Man is going to show up. And considering that none of us knew... we must be always prepared. We do not need another breaking news to spread for us to get alarmed. We do not need another group to tell us to cry mightily unto God for His mercy. Everyday we should live as if it is the last day. In that way, there will be no more room for us to hate, no room for resentment but all forgiveness and repentance from the wrong deeds we have done and has done unto us. I agree. We should be ready for "whenever". I thank God that I am ready to meet my maker. Yes, I fall and fail, but I know that I am forgiven and have been bought by the blood of Christ. May you have a blessed week. Hi Jackie, I pray that many were turn toward serving Christ in spite of Camping's wrong prediction. and when he came it would be like a thief who just comes in to our house unnoticed. i didnt know about this up until i arrived home last SUnday!LOL kaau ko!hehehe!! !